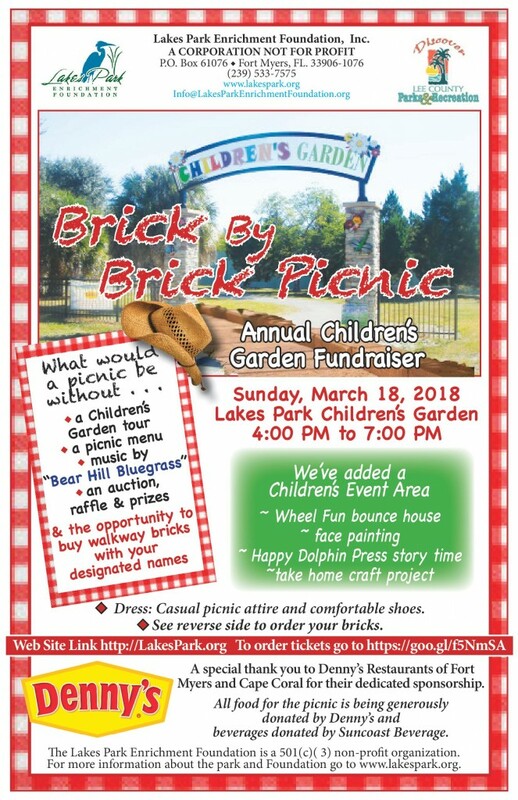 The Lakes Park Enrichment Foundation will host their annual Brick by Brick Picnic, Sunday March 18th 2018, 4:00 p.m. to 7:00 p.m. in the Children’s Garden at Lakes Regional Park, 7330 Gladiolus Drive, Fort Myers. General Admission is $25 for adults, $10 for children 5-12, free for children under 5. V.I.P. admission is $100, and includes an engraved brick. Food, beverages and entertainment are included. Tickets are available online at the Foundation’s online store. This year’s event celebrates the completion of the ABC Garden. 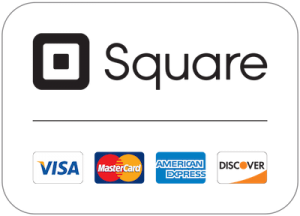 Event sponsors Denny’s and Suncoast Beverage once again provide food and drink. Bear Hill Bluegrass makes a repeat appearance. Children will be entertained by The Zaniacs of Happy Dolphin Press. Wheel Fun, one of the Foundation’s partners in the park, will provide a bounce house in the garden. Kids also get the opportunity to leave their Hand Prints On The Wall. Parents and children are encouraged to indulge in unstructured play time in the garden. The fundraising auction features experiences such as tickets to spring training games at Jet Blue Stadium and CenturyLink Sports Complex-Hammond Stadium. Other auction items include “staycations” donated by Marriott and Hampton Inn, an authentic Everglades adventure experience, and more. This is the Foundation’s fifth annual spring fundraiser. Fundraising events are currently dedicated to financing the next phase of the Children’s Garden at Lakes Park. The Foundation is preparing to enter the design and planning stage of Phase II of the Children’s Garden – the Pollination Station. Funding for Phase I was raised over the course of 2+ years, through events such as Scarecrows in the Park, auctions, general donations, and brick sales.